Man…. how great it was to get back into the game! After almost 5 years doing everything related to CAS but competing, I decided to combine my work with a little doze of an annual match. Luckily for me, Prince of the Pistoleers was perfect for my busy calendar. 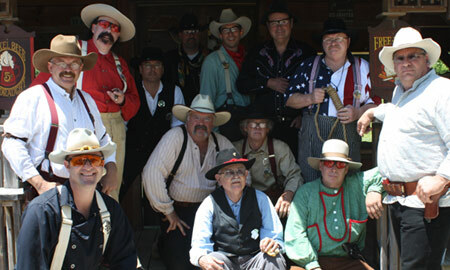 70+ shooters showed up for 3 days of fun at the Powder Creek Cowboys‘ range in Lenexa with the last 2 days dedicated to a 10 stage Main Match with a theme from Coffeyville and the Dalton gang. I have to admit I was somewhat rusty the first 5 stages but the old competitor showed up on the last day. It was too late to show some colors, but heck…. I had a whole heap of fun. I consider myself lucky to place 10 overall with such able and great bunch of cowboys and cowgirls. See Main Match Results: POP2009 . A special thanks to posse #4 and Tame Bill for the hospitality. I’ll be back for one of their monthly shoots. On a side note… I also had a nice talk with NCOWS’ Books O’Toole and he is working on a joint project with Powder Creek Cowboys. More on this later, but it warms my neutral heart to hear about clubs reaching out to each other across organizational borders.